This is a simple and lovely gold Mobius ring, created as a (surprise!) engagement ring. 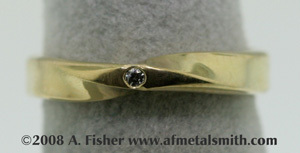 I used 18k royal yellow gold- a sumptuous and buttery yellow- that beautifully set off the good-quality diamond. 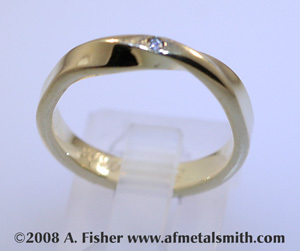 Boith the gold and the diamond were sourced from fair-trade vendors, and the metal for the ring is recycled. This was important to both the client and myself. There's some intricate symbolism also involved in this ring, but I'm keeping that private to respect my client's preferences. I did feel honored that he entrusted me in creating such an important and meaningful piece for him! The alternative photo below shows the diamond to much better effect than the first photo, which darkens it- and it's a lovely, sparkly thing in real life. 18k royal yellow gold; 0.2 carat diamond.